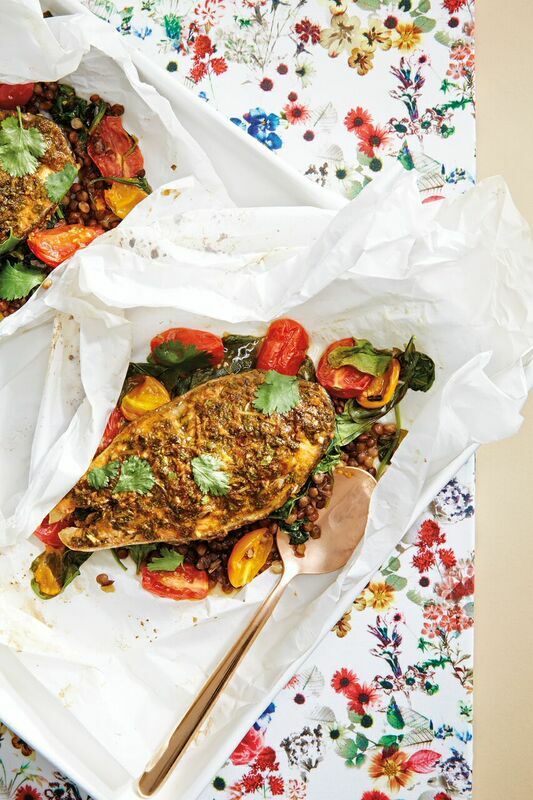 An easy and elegant way to cook fish, the en papillote method, or wrapping and baking in parchment paper, allows you to place all your ingredients in a pouch in the oven to steam them to moist, tender deliciousness. Preheat the oven to 375°F. In a small sauté pan over medium heat, toast the cumin and coriander, stirring until just fragrant, about 2 to 3 minutes. Pour the spices onto a plate to cool, and set aside. In a blender or food processor, combine 4 tablespoons olive oil, 1⁄2 cup cilantro leaves, lemon juice and zest, garlic, paprika, cumin, and coriander. Prepare 4 parchment-paper squares, each as long as the roll is wide. Season the salmon with the salt. Place 1⁄2 cup cooked lentils onto the center of each of the 4 parchment-paper squares. Top each with one quarter of the spinach, 1 salmon fillet, and 10 tomato halves. Slather the salmon and tomatoes with the blended cilantro paste, and drizzle each with 1⁄2 tablespoon olive oil. Fold the parchment squares to enclose the ingredients and crimp the edges to seal. Bake on a baking sheet for 15 to 18 minutes, depending on the fish’s thickness. Open each packet (careful of the steam), transfer the packets to a serving plate, garnish with the remaining cilantro, and serve.